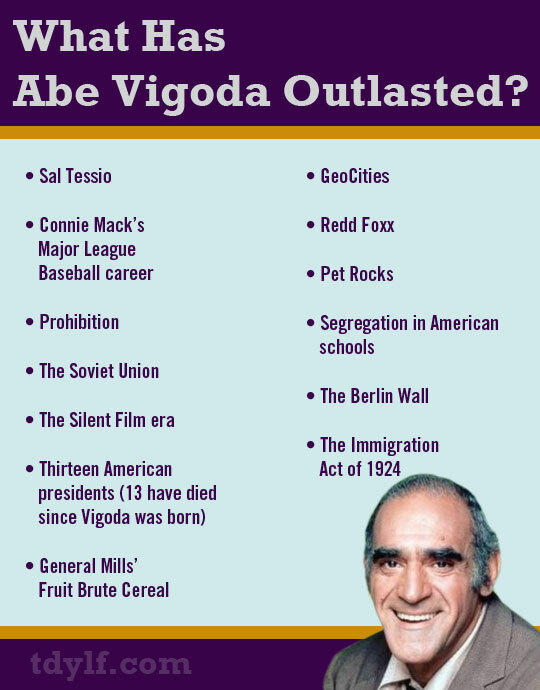 Infographic: What Has Abe Vigoda Outlasted? On February 24, 1921 in New York City, a baby with gigantic eyebrows and ears who already looked like he was 70 years old was born. He was named Abraham Charles “Abe” Vigoda. This baby quickly grew up to find a niche in Hollywood as everyone’s favorite old guy, most notably as the traitorous Sal Tessio in The Godfather and as the treacherous Grandpa Ubriacco in Look Who’s Talking. And he still roams the earth, which is sort of amazing. What has Abe Vigoda outlasted in his lifetime? Mickey Rooney’s got him beat by a year. I propose a fight to the death between Mickey Rooney and Abe Vigoda. I approve of any excuse to make a post about Abe Vigoda. Abe Vigoda waved to me once in Times Square.